„I don’t know whether you have noticed but I made another post clearing up a previous misunderstanding. As I understand it, you can distinguish red, yellow, green and blue but might have a green-turqoise confusion. It would be nice if you could be more specific about your colour vision anomaly, so that people like me can understand better about what you can see. I’ve heard that green weak people are often unaware of their colour-anomaly until they have their colour vision tested. I will answer emails that show no condescending [tone]. I remember you were not willing to learn, but I am glad you changed your mind. I am green-weak, my vision anomaly is deutanomaly. Yes, I distinguish Red very well, I even like red. When looking from 5th floor at the road red cars are the most obvious to me. I can distinguish red, green, blue, all basic colours in fact (brown, pink etc). Sometimes I confuse mauve with blue. I deal best with colours of objects that reflect light. When they emit lights, such as car back lights, I cannot distinguish well between read and orange respectively orange and yellow. In fact I have problems naming colours of small emitting lights such as flying plane lights. I was unaware of my anomaly until I was 14 when I was tested with Ishihara plates. Nevertheless I was really bad at finding mushrooms (in the field, I am from the countryside) or red berries. The difference between the berry’s red and grass’s green was not as big for me as that perceived by normal colour vision, and as such these berries did not „jump in my view”: they were not obvious. Same for mushrooms that have colours similar to the soil. This anomaly of view did not block ladies in my family to ask me if they combined nice the garments they clothed with. They seem to appreciate my aesthetic sense. It is important to understand that most of the problems colorweaks (or colorblinds) have is due to a colour on a background,not the colour itself. The colour / background colour combination generates the confusion, and in reality these combinations are rare. Mr. Ishihara had to work a lot with his colourblind assistant to develop the colour scheme of his plates. I didn’t know that, I saw the photo you linked to and the berries in it are quite small, quite fine detail in comparison to leaves. *Terms referring to the right side are orthographically longer words („starboard”, „right”, and „green”), while terms referring to the other side are orthographically shorter words („port”, „left”, and „red”). *Q:Any Red Port left in the can? A:Two drops of Red Port left. While many aspects of aviation depend on color coding, only a few of them are critical enough to be interfered with by some milder types of color blindness [such as green weakness]. Some examples include color-gun signaling of aircraft that have lost radio communication, color-coded glide-path indications on runways, and the like. Some jurisdictions restrict the issuance of pilot credentials to persons who suffer from color blindness for this reason. Restrictions may be partial, allowing color-blind persons to obtain certification but with restrictions, or total, in which case color-blind persons are not permitted to obtain piloting credentials at all. In the United States, the Federal Aviation Administration requires that pilots be tested for normal color vision as part of the medical certification that is prerequisite to obtaining a pilot’s license. If testing reveals color blindness, the applicant may be issued a license with restrictions, such as no night flying and no flying by color signals—such a restriction effectively prevents a pilot from working for an airline. The government allows several types of tests, including medical standard tests (e.g., the Ishihara, Dvorine, and others) and specialized tests oriented specifically to the needs of aviation. If an applicant fails the standard tests, he or she will receive a restriction on their medical certificate that states- „Not valid for night flying or by color signal control.” He/she may apply to the FAA to take a specialized test, administered by the FAA. Typically, this test is the „color vision light gun test.” For this test an FAA inspector will meet the pilot at an airport with an operating control tower, and the color signal light gun will be shone at the pilot from the tower, and he or she must identify the color. If he passes, he may be issued a waiver, which states that the color vision test is no longer required during medical examinations. He will then receive a new medical certificate with the restriction removed. This was once a Statement of Demonstrated Ability (SODA), but the SODA was dropped, and converted to a simple waiver (letter) early in the 2000s. I also came across a related story (I can’t remember where) about someone who wanted to be a train driver who was also green-weak, he was excluded despite being able to distinguish the colours red, yellow green and blue, which are the colours used by the railways. He thus described his exclusion as unfair. I haven’t quite understood the use of blue in train signals but I know that red and green have the same meanings as on traffic lights, but yellow is an advance warning of red. In the picture linked I can spot very easy the berry. But on the field it proved to be more difficult. My wife still finds more berries than I do. And from more than 6-10 meters I couln’t tell if raspberries are ripe or not. Closer I see them well and find them well. Visual acuity, at least in this case, would also affect how far a green-weak person could see if raspberries are ripe. 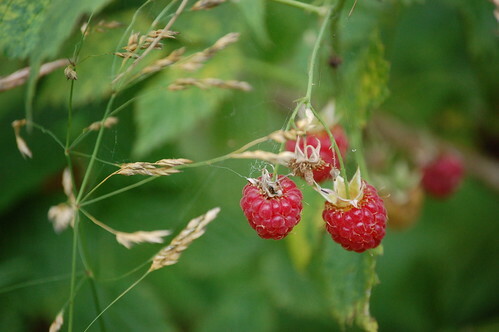 If (as I am assuming) a green-weak person with 20/20 vision cannot tell if raspberries are ripe from more than 6-10 metres, then a green-weak person with 20/40 acuity would need to be no less than 3-5 metres away to tell. There are many misconceptions about colour blindness amongst colour normal people and the most common one is that colour blind people see no colour at all, which I have long known is not the most common one. And on the topic of visual acuity, those who are indeed completely colourblind usually have low visual acuity (even if corrected) as a direct result of the absence of colour receptors, typically around 20/100, in the US and here in Australia. In fact the term visual acuity is also misleading because short-sighted people, by definition have higher visual acuity with correction than without. I do believe that even if ones uncorrected visual acuity is 20/20, corrected visual acuity could still be better, because there are people whose uncorrected visual acuity is as high as 20/10, and because in fact 20/16 or 20/12 is the normal maximum acuity of a healthy eye. How do you like this clock? If a grass vison tests were classed as an Olympic sport I know groups of Deuteranomolous individuals would be waking around with gold medals. The aritcle I linked to is about green-weak people being able to distinguish subtle shades of khaki that look identical to a normal trichromat. I guess this would be the case for red-weak peolpe too. Also, if your father-in-law is red-weak then that’s good news becuase you daughters could have ehnance colour perception see this article.